Don Perkins passed away on June 9, 2009 in Modesto, CA. He was a warm, caring and friendly classmate, and unselfish leader to his teammates. Don was an exceptional, all-around athlete at Piedmont High, earning varsity letters in football (3), basketball (2) and baseball (2). On the basketball court he was a starting guard as a junior when PHS won the Foothill Athletic League Championship, and the 2nd leading scorer behind Hall of Fame forward Tom Henderson in his senior year. In football Don was All-League First Team quarterback as a seinor, leading the Highlanders to their 1st undefeated season in 23 years and the top ranked Division B school in California. 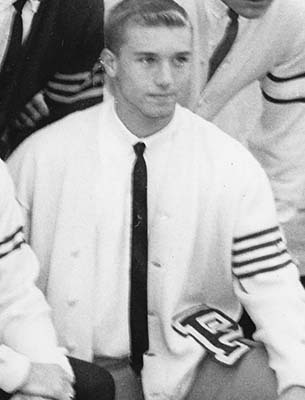 After graduation Don attended Laney Junior College (Oakland) and led the Eagles to an undefeated season, including a bowl game defeat of City College of San Francisco and O.J. Simpson for the Junior College National Champsionship. Don transferred to San Jose State and excelled at quarterback for the Spartans from 1967-1969. In May, 2014, Don's 1966 team was the first football team awarded Hall of Fame honors at Laney Junior College. Don is survived by his wife Anne, his daughter Kandi Presson, his son Kenneth, his sisters Terri and Denise, and his brother Tom. Don Perkins was a good friend in high school and an extremely close friend in college. He and I were fraternity brothers in Alpha Tau Omega at San Jose. We were room mates in the fraternity and later lived in an apartment for a year with two other ATOs. I can’t help smiling just thinking of those days. I particularly remember his joyful laugh. Oh did we have fun. He is and will continue to be missed by those that knew him. I'll always remember the season that could have been when Don and I teamed at guard, along with Rand Huff at center, and Tom Henderson and Jim Kilmartin at forward on our senior year basketball team. We went thru the first round of FAL games undefeated, and I'm confidant that without an injury to Tom would have won them all. In the first Acalanes game, I was leading a fast break and got to the free-throw line where probably out of control I jumped into the air and was in trouble. I was in the air a long time, and at the last minute to my right I saw Don and passed him the ball and saw him bail me out with a easy layup. Thanks to 34 points from Tom we blasted Acalanes 67-44. But that's an example of the team player Don was. Take a look at the Clan O Log. He was involved in many student groups and I dont think you'll see one picture without that beautiful smile on his face. I'll always remember him that way. Don Perkins was an incredible athlete, friend, teammate and always had a smile being around him. I never had a chance to watch him play basketball as he was too busy being the point guard running the team. His competitiveness drove our team and made me a better player. He was the consummate team member that you could depend on getting the job done. We won becuse we had all around players like Don. Where I really enjoyed watching Don play was on the PHS football team as the quarterback. I never missed a home or away game watching from the grandstands. The 1966 team was the greatest football team in school history. Without Don as the QB they may have not been as great. He got the ball to Skipper, Kohlmoos, Burrows, Carmichael, George and others. He got me the ball too many times to count on the basketball court. Don was also an All American QB at Laney College. Fond memeories of Don. My family now has a close connection to Don's family: our daughter Maggie will marry Don's nephew Rick Perkins (son of Don's brother Tom). I didn't know Don real well in high school however I remember him since he was a star athlete and a friendly person. He must have been in some of my classes (yes PHS '66) although memory is dim.. I had a chance to show Tom and his wife Cathy (also PHS, nee Crist) the '66 30th reunion booklet with classmate comments. We've enjoyed getting to know Rick's mother Norma (also PHS, nee Bishop) and we're looking forward to meeting more of the family at the wedding next month.